Dungeoneering is a popular venue for tabletop gaming. Many RPGs, including the famous Dungeons & Dragons, center around building adventuring parties and delving into the unknown to vanquish monsters and recover lost treasure. Board and card games have attempted to capture these quests in a variety of forms, from epic miniature based games to humorous card games. Dungeon Roll is one such game, which attempts to use dice and push-your-luck elements to consolidate the dungeon delving experience into a short, but exciting game. 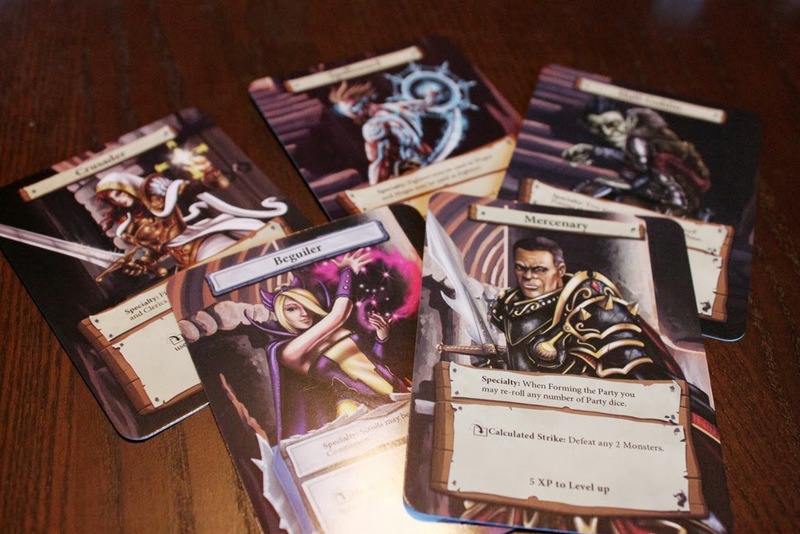 In Dungeon Roll, players attempt to score the highest XP by delving into 3 dungeons. Players alternate one delve at a time, and see just how far they can go. 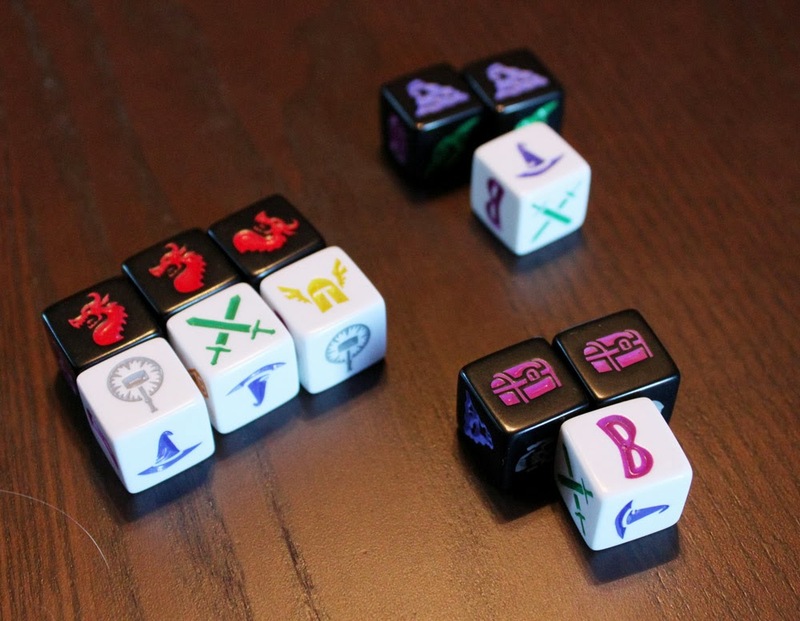 To start a delve, players roll the 7 white Party dice. Party in this case referring to a group of adventurers, not disco lights, music, and a snack bar. 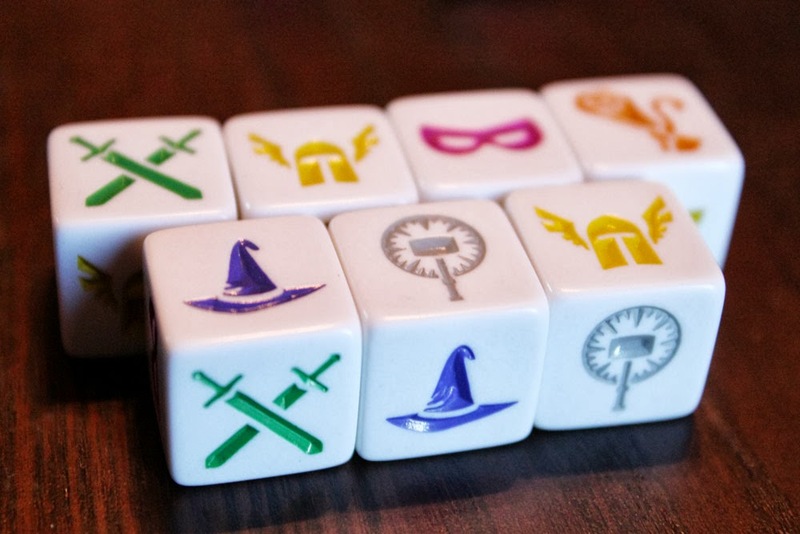 Each white die represents one of 5 different classes of adventurer – Wizard, Cleric, Rogue, Fighter, and Champion – or a scroll, which can be used to re-roll dice later. Once their party is set, the player sets off into the dungeon. Starting at level 1, dungeon dice (equal in number to the current dungeon level) are rolled, and determine what obstacles the party may face. These obstacles come in the form of monsters, dragon heads, treasure chests, and potions. The player must then deal with any dungeon dice that are rolled. First, dragon heads are set aside. When 3 or more Dragon dice are collected, the party will have to face the Dragon at the very end of the level, but first they must clear out the rest of the level. To do this, they must “spend” one of their adventuring dice to defeat each monster (although each adventurer can defeat multiple copies of a specific monster type – for example, a Fighter can defeat up to 3 Goblins). Then, they MAY spend one of their adventurers to open each treasure chest that was rolled, which allows them to draw one treasure token from the treasure chest (also known as the game box). After that, they MAY spend one of their adventurers to drink any and all potions, with each potion quaffed allowing them to resurrect any of their adventuring dice from the graveyard. Yes, when you spend any adventuring die, it goes to the graveyard. Without potions, each die can only be used once per delve. Finally, if there are 3 or more Dragon heads, the party must fight the Dragon by using 3 adventuring dice that must feature 3 different types of adventurers. (Dragon heads are set aside and carry over from level to level until they result in a dragon, at which point all dragon heads are cleared, or they are cleared by some other game effect). Defeating the dragon rewards the player with an extra XP and a treasure from the Dragon’s hoard. If the player survives all of these, they must make a choice; exit the dungeon, for which they receive XP equal to the current dungeon level, OR continue to the next level, forcing them to face another round of monsters (but increasing their XP reward if they succeed). A player who cannot defeat all the monsters (or the Dragon) is themselves defeated and send out of the dungeon with no XP. Treasure (gained via treasure chests and defeating Dragons) is worth extra XP at the end of the 3 delves, but most items also have some sort of special ability. Some can be used in place of an adventurer die; some grant extra points. One can turn all Monsters into Dragon heads (because it can be easier to face 1 dragon than face 3 Monsters and a dragon), one allows immediate escape back to the town even in the middle of a level (and still awarding XP), and there are a few more with a variety of useful effects. Finally, each player has a hero card of some sort, each of which has one constant effect ability and one once-per-delve ability. Once a player has a total of 5xp, they can “level up” their hero which improves those abilities. The game continues until all players have attempted 3 dungeon delves. Points are totaled and the player with the highest number of points wins! In addition, the rulebook has a chart of points and their level of accomplishment, so you can play the game solo and have a reference for how well you’ve scored. Of all the dice-in-a-cup (or, in this case, dice-in-a-treasure-chest) games, Dungeon Roll is perhaps the most thematic. It also bumps up the complexity with 2 sets of dice, treasure tokens with unique uses, and of course the set of hero cards with varying abilities. However much these thematic elements add, though, there is something missing from the game. It’s enjoyable in some sense, but it lacks the strength of the simple risk/reward choice of other push-your-luck dice games. Perhaps it is because of the 3-round limit. 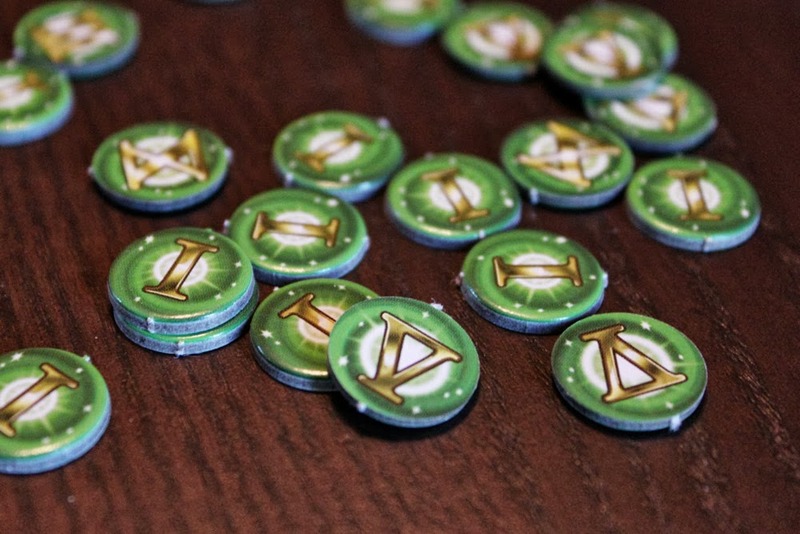 Unlike Martian Dice or Zombie Dice, which both have set numbers of points you need to score to end the game, thus allowing multiple chances to risk and let luck even out over the course of the game, you only have 3 chances to score points. However, this 3-round limit exists for a reason; each turn is relatively slow for a dice game. It’s not so bad for playing solo or playing with 2, maybe even 3, but any more than that and it will be a lengthy wait for your turn to come around again, which is not great for what is supposed to be a simple, fast dice game. This is how you fight a dragon. And ghosts. And treasure chests. Within this 3 round limit, points still depend on luck over anything else. If there were better ways of mitigating luck, perhaps it would be more substantial of a game. But, you will get much farther in the dungeon if you roll many potions; you will score far more points if you roll treasure chests, since each treasure token is worth 1xp at game end, while each entire dungeon level is also worth only 1xp. Killing monsters, the most difficult task of a long-term dungeon delve, gets you nothing except the chance to move on. Dragons are the only other way to earn XP. So, there’s very little control you have over how many points you score. Over the course of 3 rounds you may score more points in Dungeon levels than treasure, but not if you want to score a decent amount of points. Winning, or scoring well in solo play, really comes down to how lucky you are more than anything else. The tension of pushing your luck just isn’t there in any solid way. Yes, you “push your luck” by deciding whether or not to go into the next level. But the chances are you will either know that you have everything you need to at least survive safely, or you will clearly not have enough to get by. In fact, the first 3 levels are a guaranteed success, since the maximum amount of dice you’d need to spend is 6, and you have 7, and that’s worst case scenario. I’ve found that many of my delves end at level 4 or 5 and my total score is mostly dependent on how many treasure chests I roll, especially all in the same round, so a single Rogue or Champion can collect them. The dungeon level I make it to depends entirely on rolling multiple potions in one round. Scrolls are the most useless; they allow you to re-roll any number of dice, but you have to spend the scroll to do it, meaning you lose out on a die for a chance to get something better, but chances are you won’t get something better. Occasionally you will stop and look at your treasure and dice to see if there is any point in trying the next level, or if you’d be better off saving your treasure tokens for their XP value. Sure, you might get to the next level, but if you have to spend 3-4 treasures to do it, you’re giving up 3-4 points to score 1. And yet, there is something compelling about Dungeon Roll. Despite the lack of any real tension; spite the role of blind luck (rather than push-your-luck); despite the fact that heroes don’t seem all that equal; there is something pleasing about the game. Even if it’s more of a thematic diversion than a real game, the thematic nature of the game does bubble to the surface. It is what makes the game fun; it’s the reason why Dungeon Roll is so popular, despite the fact that when you look much deeper than the surface you don’t find a whole lot of substance. Perhaps a game like this doesn’t need substance. 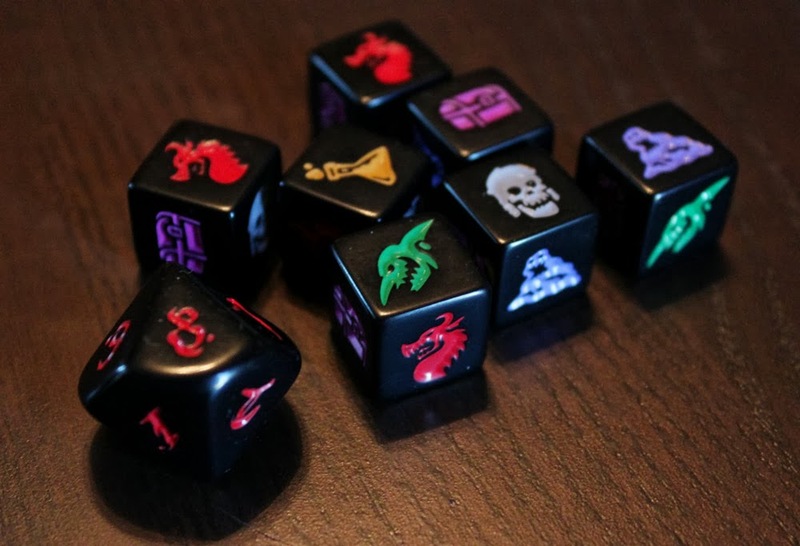 Perhaps the simple joy of rolling a fistful of dice and then sending your adventurers to defeat monsters and dragons (oh, especially the dragons) and earn treasure is enough. There is a satisfaction in reaching a high dungeon level or in wiping out your 2nd dragon in a single run. There’s something to be said for the chance to level up your hero. Even if the game is a see-your-luck experience over a push-your-luck one, you may find it to be an enjoyable diversion after all. It’s something I can’t quite put my finger on. Admittedly, I enjoy it mostly as a solo affair, as a temporary diversion or a way to kill 10 minutes of downtime without resorting to sudoku on my phone. It’s not so bad as a 2-player game, although the dungeon delves are lengthy and it doesn’t seem all that fun having to wait for 3 other players to take their turns. Welcome back, heroes! You deserve medals! At least the dice are nicely crafted, with good icons and matching colors to make it easy to remember which hero kills which monster most efficiently. 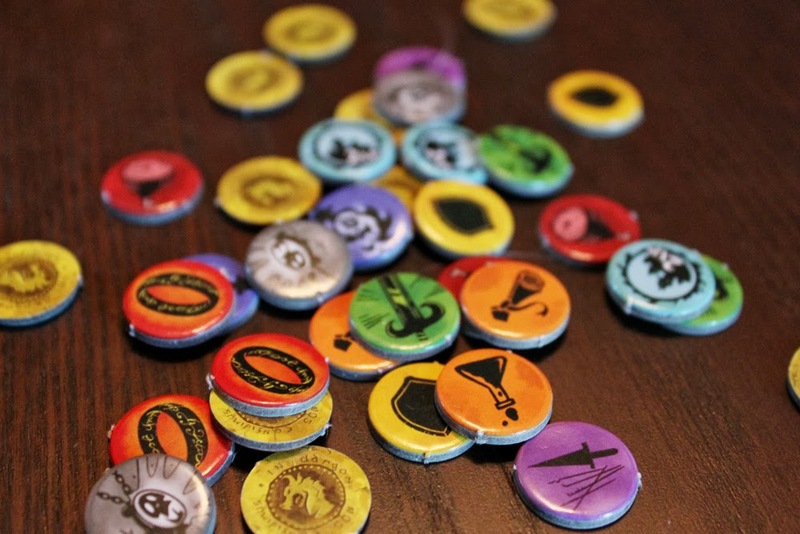 The treasure icons are far more difficult to remember, but a handy player aid is available. 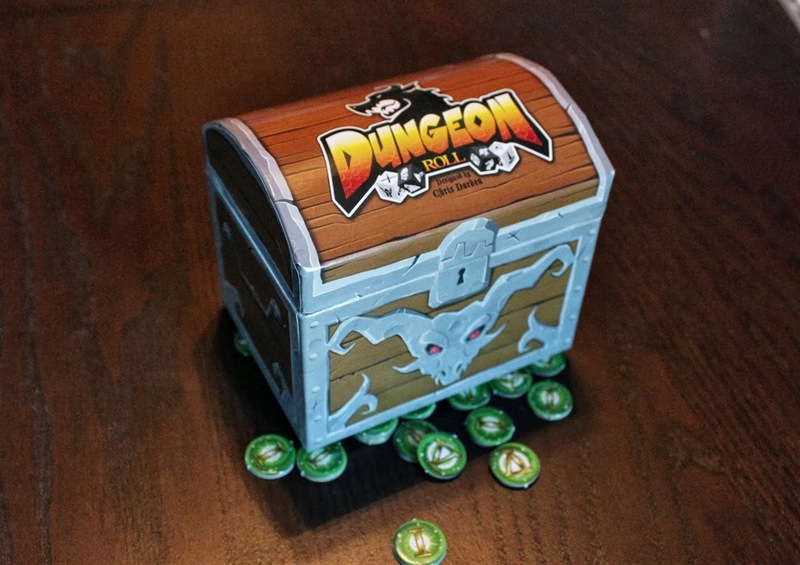 The box doesn’t readily come with a great way to keep your XP tokens and Treasure tokens separate, even though you’ll want to keep your treasure tokens in the box during the game (for random draws) and have the XP separate but easily accessible in a pile. The art on the hero cards is fantastic, although it would have been cool to see some visual differences in the “leveled up” versions of the heroes – as it stands, both sides of the card are title differently but illustrated exactly the same way. 8 Heroes included should be enough variety if you enjoy the game in the first place. Dungeon Roll may not actually give you much choice, much tension, or much control over what happens, but it does give you the sense that you are accomplishing something. If you like the theme and are looking for a quick diversionary dice game, this might be for you. It’s certainly different than other dice games of its caliber. I just wouldn’t expect the same push-your-luck tension of a Martian or Zombie dice game, or any sort of deep strategy system. Just roll your party up, take on some goblins, and collect some treasure. Pretty spot-on review. I’ve found it to be a fun 2P weeknight endeavor (en-delve-or? ), but likely wouldn’t want to play it with 3 or 4 players.